Another week is upon us and if you are wondering why I have not written a blog in a few days it's because I was at Bestival on the Isle of Wight. It was great but I have come to the realization that I may be too old for such a big festival. I was extremely tired on my return and I still am playing catch up in terms of sleep but it was worth it. In my absence Shirley sold my favourite picture by Graeme Perkins and it's the one that was featured on the poster. That was a nice thing to return to yesterday morning. It would also seem that there are far more people mooching around and visiting the gallery. That hopefully will result in a few more sales. But I have to let you know about what is coming next and that is Josh Hollingshead. He paints these crazy pictures that are epic in scale and detail. You need to see it to believe it. The PV for this exhibition is on Saturday 22nd September and it starts at 5.00. 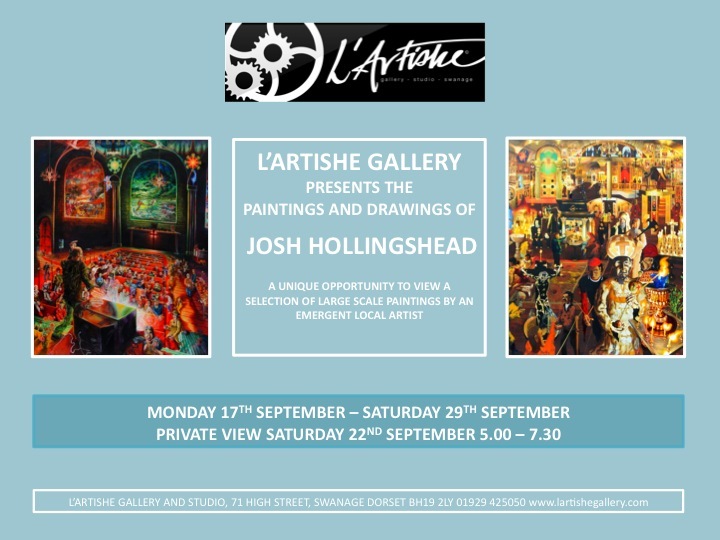 Please do come along and support Josh with his first ever solo exhibition.